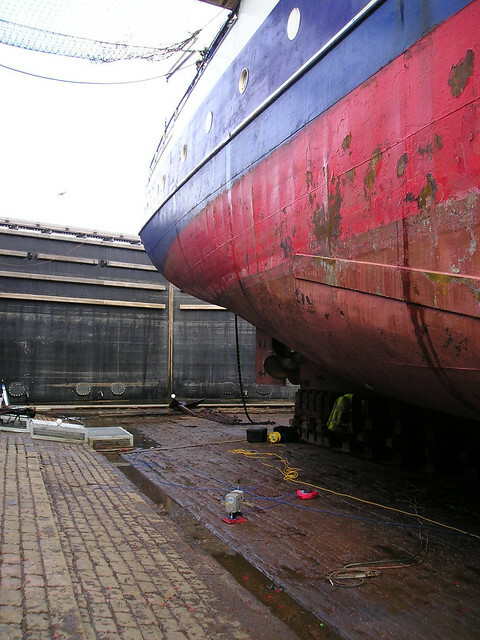 DJA/GSS provided survey services working in drydocks, slipways and sheds – from Glasgow to Malta. 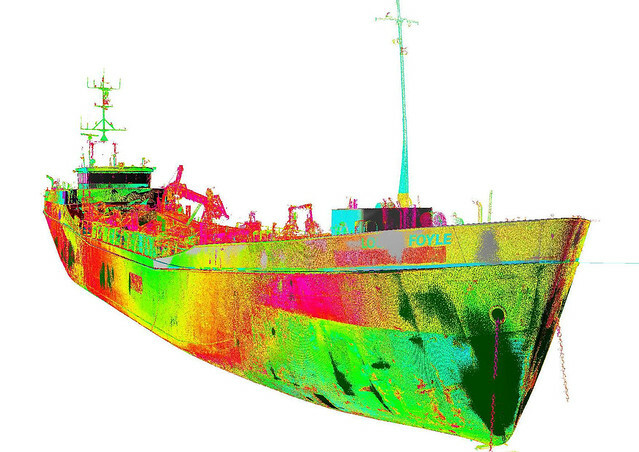 Over the past three years we have built a reputation for supplying high quality measurement with minimal disruption to other work on the vessel. Working on behalf of Naval Architects Marine Design International Ltd (MDI), we surveyed the 75m "Lough Foyle" suction hopper dredger at the Garvel Drydocks in Greenock. Here we had to work around the waterjet blasting company cleaning the vessel for painting. Careful location of the scanner and working through lunch allowed us to record the 21 scans required to construct an accurate overview of the vessel in a day.Working with the Faro LS880, details such as hawse pipe, bow thruster and hull penetrations could be recorded quickly and accurately. A second project on behalf of Advanced Yacht Services in Malta saw DJA/GSS fly in with the Faro LS880 and capture the 35m expedition yacht Drenec on the slipway. Due to be relaunched, DJA/GSS captured the hull, superstructure and tow internal compartments of the vessel in 13 hours on site, again working around teams repairing steelwork, hydraulics and paintwork. In the space of 21 hours, we captured in the region of 1.8 billion points of data on these two vessels, giving a clear and detailed point cloud model to work from to create CAD data. The next port of call saw the DJA/GSS team on the south coast of England, first Cornwall, then the Isle of Wight, capturing GRP moulds for different clients. To achieve the highest accuracy on these smaller projects, we used our Leica TS1203 total station, taking off individual points to act as a basis for CAD modelling. The 8m RIB hull required some 8 hours of measurement, while the simpler cabin superstructure took some 4 hours, all recorded on site at the clients premises. 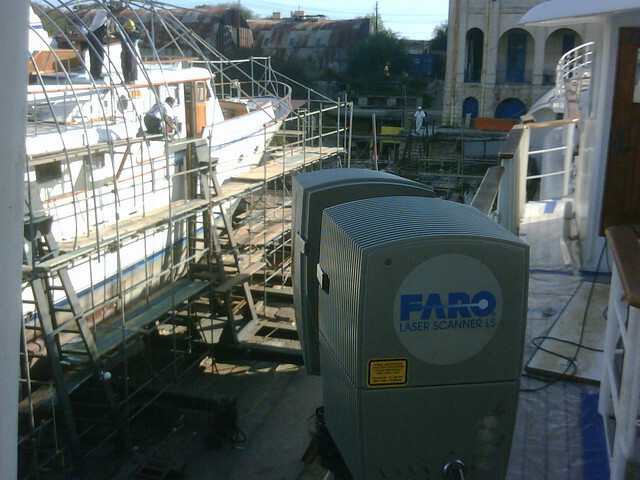 The downloaded scan data is processed using Faro's SCENE software – cleaning out unwanted areas of data, aligning the scans to the control network of survey points recorded using the total station and filtering any irregularities in the data. Once processed to a coherent data set, Pointools is used to import the scan data for viewing and use in the modelling package Rhino3D. All steps in this process are checked for accuracy to ensure thehighest levels are maintained. Once the scan data is available in Rhino 3D, the DJA/GSS team can generate sections, plans and 3D models using the point cloud as control. For stability work, we typically produce a faired model through the vessel – supplying a lightweight CAD model showing the critical structures of the vessel. Internal spaces can be modelled for fitout specialists and architects to be able to plan internal layouts. 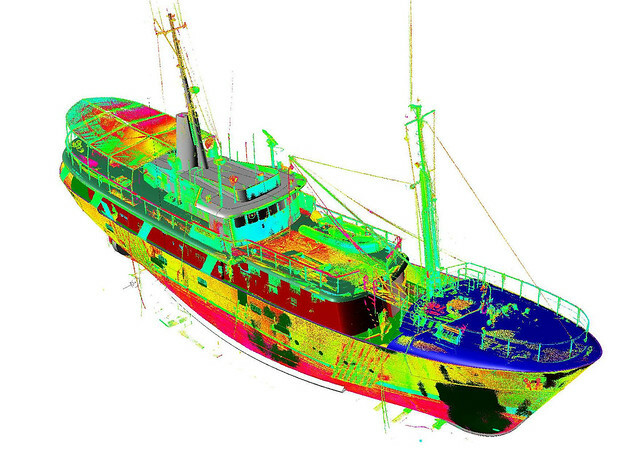 Revised steelwork for areas such as bilge keels or superstructures can be designed using the base model and checked for fit against the point cloud. 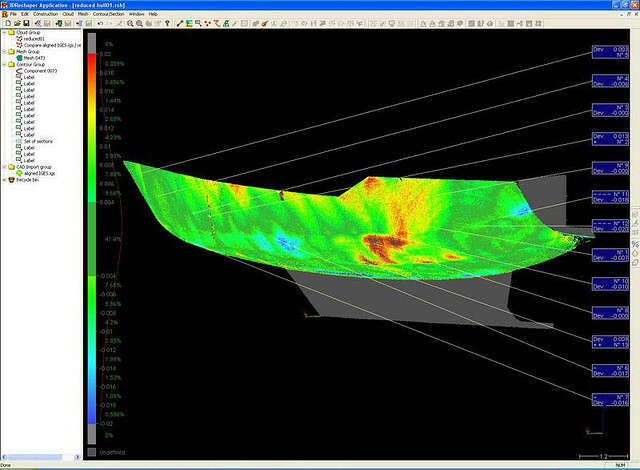 Even data such as propeller diameters can be pulled from the scan data model, useful when the original is back in the water! For more examples of our work, please see the Flickr gallery and some of our Youtube videos.